Particular artist, very communicative, she expresses herself in a creative way using natural elements and giving their charm and mystery, all with an elegant blend of colors that is never excessive, but, on the contrary, pleasant and funny. The concepts expressed, traditional but at the same time modern and yet current, are described with a very personal style but nevertheless they’re also highly interpretative. 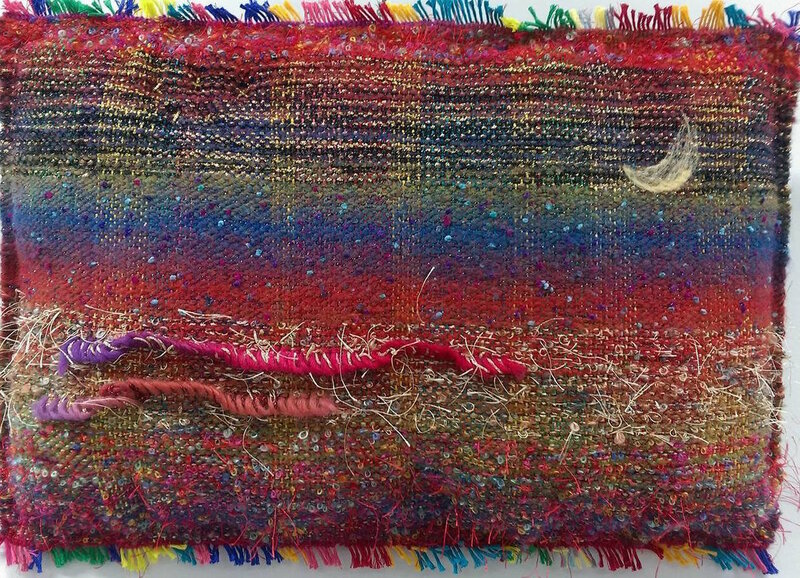 Kayo Sato’s artistic expression is expressed through the weaving of colorful yarn. The artist starts with a preparatory phase in which she makes a sketch, then she chooses and colors personally the yarns and chased, she intertwines them with a manual loom. The artist's artworks are of different size: it can go from a smaller work, about 30 cm, to the tapestry, of about 2.40 cm to 100 cm. This last requires a great job of weaving, a great skill and mastery of technique. She was born in 1972 in Fukuoka (Japan), where she lives and works as an Associate Professor at Kyushu Sangyo "Faculty of Fine Arts” Department of Fine Arts Textiles. In the Kayo Sato’s artworks, the ancient hand-crafted practice of weaving meets art: the slow proceeding, meticulous and ritual of this technique is so sublimated by the refinement of the fibers, by the preciousness of colors, which she herself prepares, and by the artistic sensitivity. As the Fates, mythological creatures who presided at the entire course of human life weaving the threads of fate, so the artist intertwines stories of life and personal perceptions, establishing rhythm and length in warps and wefts of soft and colorful wire. La sua espressione artista è realizzata con la tessitura di filati appositamente colorati precedentemente ed in seguito filati con telaio manuale completamente da Kayo, fin dalla fase preparatoria del bozzetto passando per la colorazione dei filati per arrivare alla tessitura. Le sue opere sono di varie dimensioni dal lavoro più piccolo di circa 30 cm si può arrivare all'arazzo più complesso di circa 2,40 cm per 100 cm il quale richiede un grande lavoro di tessitura, grande maestria e padronanza della tecnica.